Concept d’animation de « serveur-chanteur ». Vous êtes ici : Accueil / Uncategorized / Concept d’animation de « serveur-chanteur ». With over 10,000 shows in more than 80 countries, The Three Waiters® is the original and the most successful surprise singing waiters act of its kind in the world. They have been described as “Just Superb” by Sir Richard Branson & “Great, Absolutely Great” by the late, great Luciano Pavarotti. The Three Waiters involves three performers infiltrating as ‘real’ waiters from the commencement of the event before unleashing a dynamic performance a la The Three Tenors. At no time will your guests know that these are actors, not waiters. This is the core of the ‘hoax’. The Three Waiters is not a ‘whacky waiters’ show and the performers don’t trip up or spill food or drinks. Alfredo poses as the Banquet Manager. He is well mannered and meticulous. He dresses in his own black suit or alternatively wears the attire suitable to the venue. The other two performers are dressed exactly as the other waiters. The three performers arrive one hour before your guests and infiltrate as ‘real’ waiters from the commencement of the event up to the time of the performance. This could mean serving, topping up drinks and generally being seen. Announcement #2 – Before the main course is laid. announces that a guest offered him £50 to do so. He thanks the guest and leaves the stage. Once the main course has been laid and drinks have been topped up, Jean-Marc, a French wine waiter, makes his way to the stage and politely announces that another guest has offered him £100. He proceeds to sing a full aria in Italian. Alfredo is Italian. He is not very happy. The plot thickens as Alfredo and Jean-Marc challenge each other’s vocal abilities. Just as they agree to sing something together, a third waiter bursts onto the scene. He’s English. The show evolves into a dynamic vocal trio and together, through a variety of popular classics and humorous banter, the show culminates in a dynamic performance à la ‘The Three Tenors’. Only at the finale are their true identities revealed. event. Please be aware they are not The Three Waiters who are the original and most successful surprise singing waiter’s act of its kind in the world. The Three Waiters are sophisticated, spontaneous, very entertaining and follow an award winning, intricately designed and scripted show. It is strongly recommended that The Three Waiters are secured and not just performers who may be undercover and dressing up as waiters then singing. The Three Waiters appears spontaneous, yet is a carefully scripted operatic hoax act. The performers pose during the event as real waiters before coming together to conclude their performance in the style of “The Three Tenors”. Most of the show is performed in amongst the audience with a small percentage at a clear focal point or raised stage area. Critical to the performance is a surround sound “concert hall” effect. It is imperative that speakers be placed evenly around the room, front and rear, so that an even sound can be heard no matter where the performers move. Built in ceiling speakers designed for public address announcements do not provide adequate sound and do not fulfill speaker requirements.  4 x handheld radio microphones (Seinheisser G100, Shure Beta 87 or SM 58 or similar quality) suitable to amplify three strong male voices. follow spot. For Wedding performances, please contact The Three Waiters as these will not be required. Please can three main meals and beverages be provided for the performers at the venue and a suitable private space or dressing room. We start as waiters serving wine along with the real waiters. When all had wine in the glasses, we begin the song a capella and then go on in full pace. A happy party starter! 2. Love Songs. Maybe it’s time for 5-6 minutes for an act with love songs if refer to a wedding. Maybe the wedding has couple of (English-speaking) favorite songs? Or would the wedding couple rather have the more modern disco hits? Or would they like more rock’n roll? 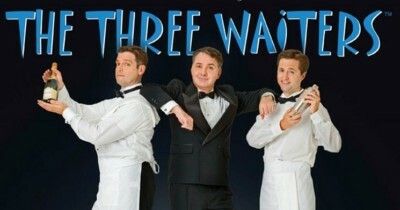 Option 1 : the Three Waiters – troupe de Londres. Registre musique classique ( un ténor Français, un ténor Anglais, un ténor Italien). Option 2 : Nojesbira – troupe de Stockholm. Le prix n’inclus pas : les dépenses de voyage ( billets d’avion, location de chambre simple pour les artistes, les repas/diner sur le site avant l’événement. La troupe n’a actuellement pas de vidéo illustrant leur performance de « serveur-chanteur ».